The Supreme Court has stopped the National Assembly from going ahead to enact into law the Fourth Alteration Act which seeks to amend the 1999 constitution. The Chief Justice of Nigeria (CJN), who presided at the hearing of a suit filed by the federal government to stop the National Assembly from overriding President Goodluck Jonathan's veto on amendments to the constitution specifically warned the parties not to do anything that will affect the subject matter of the suit. The court consequently adjourned the suit to June 18 when a new government would have come on board and the legislative session of the present National Assembly would have ended. The Supreme Court's order has effectively killed the threat by the National Assembly to go ahead to pass the amendments into law thereby rendering the whole amendments process, which gulped over a billion naira, a wasted exercise. In order to stop the National Assembly from going ahead to pass the controversial amendments to the constitution, the Attorney General of the Federation (AGF) applied for an order of interlocutory injunction restraining the lawmakers from taking any further step towards passing the Constitution of the Federal Republic of Nigeria (Fourth Alteration) Act, 2015 into law pending the final determination of the suit earlier filed before the court. The application, which was filed by the counsel to the AGF, Chief Bayo Ojo (SAN), was brought pursuant to Order 3 Rule 14 of the Supreme Court Rules as amended and had cited 12 errors in the proposed amendment. The AGF premised the application on the grounds among others that the National Assembly was determined to proceed with passing the constitution by overriding the veto of same despite the fundamental nature of the issues raised against it. The suit had also asserted that the Bill was not passed by four-fifth of the two chambers as required by the constitution. It stressed that “Alteration to constitution cannot be valid with mere voice votes unless supported by the votes of not less than four-fifths majority of all members of the National Assembly and two-thirds of all the 36 state houses of assembly." When the case came up before the court, the CJN sought clarification on whether the suit was properly instituted, saying that the president should have filed the suit by himself and not through the AGF. According to him, since the dispute is not between the federal government and the federating units, the proper person to file the suit should be the president. However, the federal government's lawyer, Chief Ojo, maintained that the suit was properly constituted. The justices of the court also sought to know whether it was right not to make states' houses of assembly parties since they participated in the process that resulted in the amendments. The court therefore adjourned the suit to June 18 for Ojo to address the court on whether the case was properly constituted. But before the adjournment, the CJN said: "Parties should not do anything that will affect the subject matter of the suit." 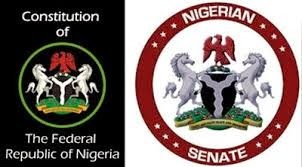 In the application for injunction, the AGF said it was more in the interest of the whole Nigerian polity that the issues in the substantive suit herein be resolved one way or the other before the National Assembly can proceed further on the proposed alterations to the constitution. The AGF said: "Hon. Samson Osagie, Minority Whip of the House of Representatives said to the whole world at a press conference purposely called on the issue in this suit that despite any case filed against the said Act (which actually is a Bill); the National Assembly would go ahead to pass it into law." The AGF said the balance of convenience tilts in favour of resolution of this suit before any further step could be taken on the Bill. In an affidavit deposed to by one Theophilus Okwute, a lawyer in the chambers of Chief Bayo Ojo, SAN and Co, Okwute in the affidavit attached to the application said he was aware of a press conference held by the defendant. He said: "That I listened to Hon. Samson Osagie, the Minority Whip of the House of Representatives on the NTA 9 O’clock News on 24/04/2015 when he said that the National Assembly would go ahead to pass the (Fourth Alteration) Act (Bill) 2015 into law despite any court action because no order had been made against the National Assembly to restrain it from doing so. "That by that very disposition of the said Hon. Samson Osagie who spoke to the press as a Principal Officer of the Defendant/Respondent, it is clear that the Defendant/Respondent is determined to proceed to pass the Fourth Alteration Act (sic) into Law despite the pendency of the substantive suit herein. "That fundamental questions were raised by the Plaintiff/Applicant on the proposed alterations to the Constitution of the Federal Republic of Nigeria through the Fourth Alteration Act, 2015 which is in issue in this suit. "That it will be in the larger interest of Nigeria that those issues be resolved before the Defendant/Respondent takes any further step in giving effect to the proposed alterations to the Constitution. "That with the utterances of Hon. Samson Osagie at the Press Conference earlier alluded to in this affidavit, it is clear that the Defendant is determined to ignore the proceeding before this Honourable Court on the proposed alteration and proceed to give effect to the alterations to the Constitution. "That the Defendant/Respondent will not lose anything or suffer any prejudice if this application is granted. "That the balance of convenience tilts in favour of granting this application. "That the whole Nigerian legal system shall be put into confusion if the Defendant/Respondent proceeds to give effect to the Fourth Alteration Act (Bill) 2015 and this suit succeeds such that the Constitution remain unaltered, meaning that the Act is void and or no effect. "That the Constitution is the basic law of Nigeria and should only be amended following due process. "That it will be in the interest of justice to grant this application."